With this ambience surround pack you get souks, wallas, muezzins, city ambiences and a lot more from the Arabic world, captured during an extensive field recording trip through Morocco. 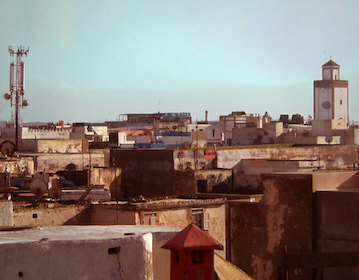 For this surround ambience library we captured the beauty of the urban Arabic world of Morocco. We visited three very different Moroccan cities, Marrakech, Essaouira and Tangier. These are all very colorful, lively and diverse cities, where we found a lot of unique places to capture these great surround ambiences. We captured sounds from the souks (markets), the medina (old town), the calls of muezzins, rooftop city ambiences and a lot more! Through some Maroccan relatives we were able to record at special locations where access is normally not possible. We Recorded with a Double MS setup (Sennheiser MKH30, MKH8040, MKH8050) to be fast and flexible as the environment was very turbulent at times. We could easily change our position and were ready to start a recording within seconds to find the perfect spot and timeframe for each particular ambience. Apart from beeing showered with old rotten fish blood everything went pretty well! This library is well-suited for a wide number of different situations, as some of the sounds are more diffuse and could be used as general urban Arabic ambiences. In the old town where nearly no traffic is audible (except some mopeds from time to time) we were able to record some nice wallas and the bubbly hustle and bustle of the people. We carefully encoded every ambience to a discret 5.0 channel file for convenience.